Avery Architectural & Fine Arts Library and GSAPP are pleased to announce the opening of a co-presented exhibition, Model Projections, October – December 15, 2018 at the Arthur Ross Architectural Gallery, Buell Hall, Columbia University. Co-curated by Jennifer Gray and Irene Sunwoo, Model Projections investigates the complex pathways between architecture and its representation through an examination of the practice of model making. While models have long occupied a central role in the design and building processes, during the postwar period the production and function of models expanded as architecture firms increasingly commissioned elaborate three-dimensional representations that were extraordinarily precise in detail—from simulated materials to landscaping, from designer furniture to electrification. The exhibition reveal the model as a site of collaboration, negotiation, and speculation—not unlike the full-scale building that it anticipated. Drawing primarily upon the collections of Avery Library’s Department of Drawings and Archives, the exhibition focuses on an ecosystem of architectural model making during the mid-twentieth century. It features original photographs, correspondence, and ephemera from the archives of Skidmore, Owings & Merrill; photographer Louis Checkman; and especially the pioneering model maker Theodore Conrad, whose material experiments and specialized production techniques offer a framework for questioning the relationships between technology and craft, authenticity and authorship, architectural vision and systematized labor. 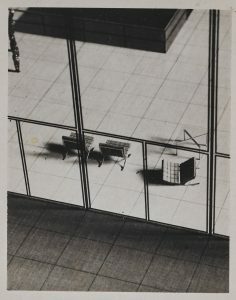 Image credit: Photo documenting Neue Nationalgalerie model: view into model, fallen Barcelona Chair. Theodore Conrad papers 1937-1991, Avery Architectural & Fine Arts Library, Dept. of Drawings & Archives. This entry was posted in Drawings & Archives, Exhibitions, GSAPP on October 24, 2018 by Carole Ann.